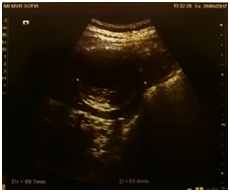 Stoyanov, V. Ultrasonography as the First Method of Choice in the Diagnosis of Primary Extrahepatic Echinococcosis: Case Report. (2019) J Anesth Surg 6(1): 1-3. © 2019 Stoyanov, V. This is an Open access article distributed under the terms of Creative Commons Attribution 4.0 International License. The aim of this presentation is to show the high informative value of ultrasonography as the first method of choice in the diagnosis of atypical extra-hepatic forms of echoconcosis. Echinococcosis is zooanthroponosis and is most commonly caused by the larval form of E. granulosus. Echinococcal cysts develop, most commonly in the human liver and second - in the lung. Rare primary localization is echinococcus cysts of greater omentum and spleen. Ultrasonography is first method of ch?ice for diagnostic. The main clinical and laboratory diagnostic methods are immunoelectrophoresis and serological evidence of echinococcosis by ELISA. Timely surgical treatment give it a chance to cure. The use of post-operative antiparasitic chemoprophylaxis and therapy is recommended. The echinococcosis is zooantroponosis. It is caused by the larval form of E. granulosus. The mature parasite inhabits the intestines of some carnivorous animals and the larval form develops into the human tissue and body. Humans are infected orally by ingestion of food, water infected with the eggs of the parasite, and also in direct contact with infected animals. Echinococcal cysts develop, most commonly in human liver, and rarely primarily in the lung. Echinococcosis of omentum is predominantly secondary and is due to primary ruptured cysts of the liver and spleen. 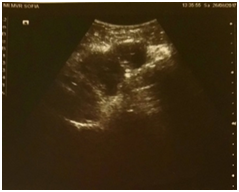 In this clinical case we present a rare form of atypical primary echinococcosis of the spleen and omentum and the role of abdominal ultrasonography as the first method of choice in the diagnosis and the follow-up of patients. A 30-year-old male, hospitalized with complaints of weight and pain in the upper abdominal region and the left hypochondrium, for a year but have increased last days. His GP and a gastroenterologist done abdominal ultrasonography and identified a cyst of the spleen (40 mm). Their suggestion was to follow-up the cyst, and no further studies being conducted. Last 2 days the man has complaints of burning and pain in the lower abdominal region, frequent urination. The patient was consulted by a nephrologist and a urologist. Three cysts formation were detected in the pelvis, around the bladder, approximately 20 mm, 35 mm and 57 mm (Fig. 1). The control ultrasonography revealed that the spleen cyst increased and reached the dimensions of 64/69 mm (Fig. 2). The patient is also consulted by a surgeon. Blood tests were also carried out: leukocytes - 14.8, erythrocytes - 6.06, hemoglobin - 174, hematocrit - 0.52, platelets - 187, normal biochemical values and no data on peripheral blood eosinophilia. It was perform a serological ELISA test - positive for echinococcosis. X-ray of the thorax did not detect cystic lesions. Preoperatively, the patient was consulted with parasitologist. An anti-pneumococcal vaccine was put him for prevention of infection. Elective surgery was done. Laparotomy, splenectomy and resection of omentum were performed. Тhe finds during the operation confirmed ultrasonography descriptions. No other echinococcal cysts were found in liver and other abdominal organs. In Fig. 3, Fig. 4, Fig. 5 and Fig. 6 are presented the specimens. The postoperative period past without any complications. Pathohistology confirms the echinococcal genesis of all cysts. The patient was consulted with parasitologist after surgery and chemoprophylaxis with Albendazole was given for 4 months. Echinococcosis is zooantroponosis that can affect any organ or soft tissues in the human body. It usually runs asymptomatically. Less commonly, primary Echinococcosis may affect the spleen (0.5-4%), omentum (3.9-12.5%), kidneys, bones, thyroid gland, pancreas and other organs, more often secondary[1-3]. Two pathways for primary dissemination in spleen and omentum are discussed. The first pathway is through the arterial flow, passing through the filter of the liver and lungs without affecting them. The second possible path is retrograde intravenous distribution via the portal venous system bypass the liver and lung[3-7]. Echinococcosis of omentum is more often secondary and is associated with a rupture of primary liver cysts or occurs after previous operations. Echinococcal cysts consist of three layers: an outer fibrous capsule, a middle layer composed of a cuticular membrane and germinative membrane. Diagnosis is usually accidental for a prophylactic examination or for non-specific complaints (weight and dull abdominal pain). Usually the first method of choice is abdominal ultrasonography, which establishes cystic lesions. It can be used as a routine screening method - harmless, repetitive, and with high diagnostic value. In a large percentage of cases, the results are fully comparable with the results of computer axial tomography (CT) and magnetic resonance imaging – MRI[8,9]. In case of difficulties and in differential diagnostics can also be used contrast ultrasonography. Observed complications of the disease are cyst rupture and anaphylactic shock, but usually the disease is asymptomatic. Complaints occur with large cysts that can squeeze adjacent organs or rupture[2,11].Therefore, echinococcosis should be treated as soon as possible after diagnosis. Blood tests may detect eosinophilia, but it is not mandatory. The Casoni skin test may be positive but not specific. The two most common and widely used laboratory diagnostic tests are immunoelectrophoresis, with a sensitivity of 66-68% and a serological test of IgG by ELISA method, with a sensitivity of 95-97%. Differential diagnosis is made with diseases of the spleen as well as of the adjacent organs: pseudocysts of the spleen, primary and metastatic tumors, abscesses, hematomas, tumors and cysts of the pancreas, etc. The echinococcosis of omentum should be distinguished from benign and malignant tumors of omentum, cysts and pseudo-cysts. Final confirmation of the diagnosis is made by pathohistological examination of the cyst and identification of previously described specific structures. A standard surgical procedure for splenic echinococcosis is conventional splenectomy. Less frequent method is partial splenectomy and enucleation. 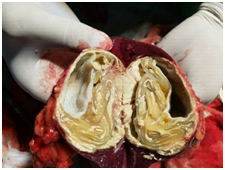 In primary echinococcal omental cysts, a method of choice is the removal of cysts, together with their fibrous capsule, as well as partial resection of omentum or omentectomy. For small and uncomplicated cysts a laparoscopic surgery method is chosen but it is still not widely approved and applied. Post-operative prevention and therapy with Albendazole or Praziquantel is recommended to reduce the risk of secondary dissemination and relapse. Atypical abdominal forms of echinococcosis should be discussed in patients with cystic lesion in the abdominal cavity, especially in endemic countries. Abdominal ultrasonography is the first method of choice with high sensitivity and specificity. Positive serology test is confirmed by ELISA. The treatment in each patient should be individualized and the surgery is the best option for cure. Adjuvant antiparasitic chemoprevention and therapy is recommended. 1. Pukar, M.M., Pukar, S.M. 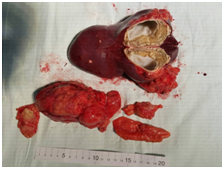 Giant solitary hydatid cyst of spleen A case report. (2013) Int J Surg Case Rep 4(4): 435– 437. 2. Gupta, V., Kaira, V., Sharma, J., et al. 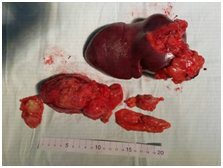 Primary Hydatid Cyst of Spleen: A Rare Entity. (2014) J Trop Dis 2:131. 3. Franquet, T., Montes, M., Lecumberri, F.J., et al. Hydatid disease of the spleen: imaging findings in nine patients. (1990) Am J Roentgenol 154(3): 525-528. 4. Ionescu, A., Jakab, A., Jutis, T., et al. Splenic hydatid cyst (Article in Romanian) (1990) Rev Med Chir Soc Med Nat Ias 94: 525-528. 5. Kiresi, D.A., Karabacakoglu, A., Odev, K., et al. Uncommon Locations of Hydatid Cysts. (2003) Acta Radiol 44(6): 622-636. 6. Sahu, S., Srivastava, R., Bahl, P., Sachan. Primary Hydatid Cyst Of The Spleen: A Rare Site Of Presentation. (2007) Internet J Surg 14(1). 7. Uriarte, C., Pomares, N., Martin, M., et al. Splenic hydatidosis. (1991) Am J Trop Med Hyg 44(4): 420-423. 8. Iarumov, N., Gaidarski, R. Surgical dissease of the liver. (2007) Surgical Disseases. 9. Ilica, A.T., Kocaoglu, M., Zeybek, N., et al. Extrahepatic abdominal hydatid disease caused by Echinococcus granulosus: imaging findings. (2007) AJR Am J Roentgenol 189(2): 337-343. 11. Williams, R.J., Glazer, G. Splenic cysts: changes in diagnosis, treatment and aetiological concepts. (1993) Ann R Coll Surg Engl 75(2): 87-89. 12. Hamamci, E.O., Besim, H., Korkmaz, A. Unusual locations of hydatid disease and surgical approach. (2004) ANZ J Surg 74(5): 356-360. 13. Ghafouri, A., Nasiri, S., Far, A.S., et al. 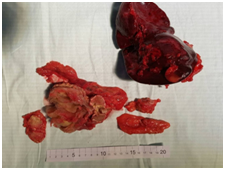 Isolated Primary Hydatid Disease of Omentum; Report of a Case and Review of the Literature. (2010) Iran J Med Sci 35(3): 259-261. 14. Berrada, S., Ridai, M., Mokhtari, M. Hydatid cysts of the spleen splenectomy or conservative surgery. (1991) Ann Chir 45(5): 434–436. 15. Buttenschoen, K., Carli Buttenschoen, D. Echinococcus granulosus infection: the challenge of surgical treatment. (2003) Langenbecks Arch Surg 388(4): 218-230. 16. Khoury, G., Abiad, F., Geagea, T., et al. Laparoscopic treatment of hydatid cysts of the liver and spleen. (2000) Surg Endosc 14(3): 243-245. 17. De, U. Rare primary extrahepatic intraabdominal hydatid cysts. (2009) Trop Doct 39(3): 172-175.